RAW DOG FOOD IS MORE WORK, BUT MANY DANE OWNERS THINK THIS IS THE ONLY FOOD! In 1993, an Australian veterinary surgeon named Dr. Ian Billinghurst wrote a book called “Bones and Raw Food (BARF) diet”. BARF and the raw dog food “movement” was born. The acronym has since evolved to Biologically Appropriate Raw Food but the idea of feeding raw meaty bones, raw meat, veggies and fruits is the same and is getting more and more popular. Many Great Dane breeders and owners are switching to BARF, while some still think it’s a mistake. BARF opponents argue that there will be an increase in illness if using raw diets due to exposure to parasites and bacteria potentially present in raw meat. There is also an argument that any raw diet wouldn’t be balanced and this would cause health issues later on – particularly for our delicate great danes. And many vets won’t embrace a raw diet because there has been no scientific research assessing the raw food approach. To BARF, or not to BARF? So who is right? There really is no hard data to support a raw diet as being more beneficial than a balanced and formulated processed diet. But there is also no body of evidence that would indicate the dangers of a raw diet outweigh the potential goodness. After speaking to many breeders, both for and against, and spending a very long time researching BARF and looking at several danes who are thriving on raw dog food, we believe raw dog food diets do far more good than harm – provided it is done properly. Having said that, unless you’ve got some experience with raw food for dogs, we don’t think it is appropriate for dane puppies during the first year, simply because it is too difficult to keep accurately recalculating the caloric intake necessary as your junior dane grows and because it is so important not to over provide calcium and protein. The choice between premium dog food in a can or a bag and a raw diet also has to take in lifestyle considerations. If feeding raw, the food has to be prepared, meal ingredients and quantity have to be planned. This takes considerably more time than simply providing a quality processed dog food with necessary supplements. If you can’t afford the time (long work hours perhaps?) or the commitment to do it properly, stick to premium dog food. Your dane can thrive on that diet as well. If you believe in the benefits of raw and you are willing to spend the time consistently providing nutritionally balanced meals, then raw food should be considered because great danes really do well on this type of diet. 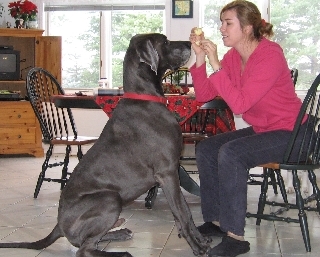 In general terms, you need to feed your great dane between 2 to 3% of its bodily weight daily. So for a 160 pound eating machine, you need to supply about 4 pounds of food every day. The base of most raw diets will be raw meaty poultry bones, but variety is also important and beef, lamb and pork bones can also be served. Chicken bones should be backs, knecks and wings. Leg bones are load bearing and a bit tougher. Pork bones are also OK these days, although there are still those that say this is not healthy. Years ago, that may have been the case, but today pork production is far safer in terms of bacterias in the meat and you can treat the bones with oxydrops (see below) to make sure there is nothing there that will hurt your dane. It is important to understand that if feeding a raw diet based on raw meaty bones, you should never give just the bones or just the meat. Your dane needs a balanced diet and this includes the right levels of phosphorus, protein and calcium. Nature has the required balance sorted out in combination with bone and meat – not one or the other. For a great dane, the ratio should be about 48% bone and 52% everything else (meat, organ, veggies,fruit). Many raw diet breeders soak the raw meaty bones in apple cider vinegar for a couple of minutes before serving. This vinegar contains many of the nutrients so important for your Dane’s balanced diet. 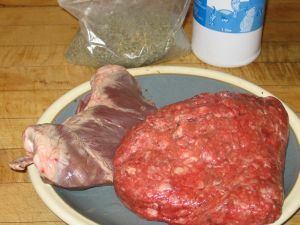 Some BARF breeders treat the raw bones and meat with oxydrops to kill any bacteria or parasites that may be present. This is certainly not a bad idea, however the product is expensive. Many other breeders point out that a dog's digestive system is different and the stomach acid they produce is 100 times more concentrated than that of a human's. A dog stomach (even a delicate Dane!) can handle most bacterias or parasites without difficulty. This is a personal choice. We don't use it because we don't think it's necessary. But, if you are concerned with the main fear of anti-BARFers - illness due to exposure to bacterias - using oxydrops effectively neutralizes this concern. Organ meats should also be provided from time to time and in the perfect menu will make up about 10 to 15% of the “meat” portion of the diet. This is an excellent protein source (heart, liver etc) and certainly beats the crude protein of beaks, feathers and hooves! The final food group is vegetables and fruits - a small but important component of the raw dane food diet. This should be based primarily on leafy green type vegetables although just about any veggie is good. The only things you should not feed is union, spinich and grapes. The veggies do have to be ground up and served in a paste however, because Great Danes cannot digest them otherwise. They will simply pass through the system (provided you can get him/her to eat it) and will be of no value. We've reviewed a couple of the raw food ebooks available online (surprisingly, there aren't that many, although there are many raw dog food books in print). We found this raw food dog book helpful and learned quite a bit from it. Except grapes, there is no fruit that cannot be included in the menu, and in fact it is surprising how much your dane will take to some of them. Each animal is different, but ours loves apples – does back flips for them! Who knew? If you are sold on the benefits of a raw diet but are concerned that you don’t have the time or the nutritional knowledge to produce what your dane needs, you do have other options. Many raw dog food companies are springing up in all regions and they offer pre-mixed solutions. Some ship frozen meals already put together (all you do is thaw and serve). Some have freeze dried products that contain all the offal, veggie and fruit content (all you do is mix with raw meaty bones you provide). We haven’t included any recommendations yet because we haven’t tried them. But we do have a review program planned, and as we find products we believe in, we’ll post them here. In the meantime, a google search of raw dog food will take you to many such sites. Just be sure to check the ingredients and nutritional information before buying. You may have noticed by now that we have not provided any step-by-step recipes, but only nutritional guidelines about ingredients and proportions. That is because variety is a very important part of a raw diet – and your dane will be greatful for it! Many dane people (and dog people generally for that matter) will say that dogs don’t need variety and will do well on the same mixed and balanced meal throughout their lives. Theoretically speaking this is true. But whatever the books say, personal experience tells us that Great Danes love taste variety. In fact, ours gets easily bored with the same thing day in and day out. And if feeding raw food, variety is important because you won’t achieve a balanced diet with the same menu every day (quality processed foods are specifically formulated, but no one raw meal delivers everything). So it is important (and more convenient, frankly) to provide variety. Your dane doesn’t need veggies every night. Or chicken everyday. Mix things up a bit. The important thing is to achieve balance over time. Use the above portion guidelines and make sure that over a cycle of at least two weeks, your dane is getting 48% meaty raw bone and 52% of the rest of the ingredients (with about 10 – 12% fat, 10% organs, 15% fruit and veggies and the rest meat). Every week or so, serve a meal with a raw egg mixed in (some say this is bad because the egg white inhibits some digestive functions, however the nutrients in the yoke more than make up for this). Some people use some yogurt, or cottage cheese. Variety. Variety. Variety! A raw dog food diet isn’t for everyone. It can be a lot of work and some breeders still won’t touch it. But if it is designed and administered properly, your dane will thrive!